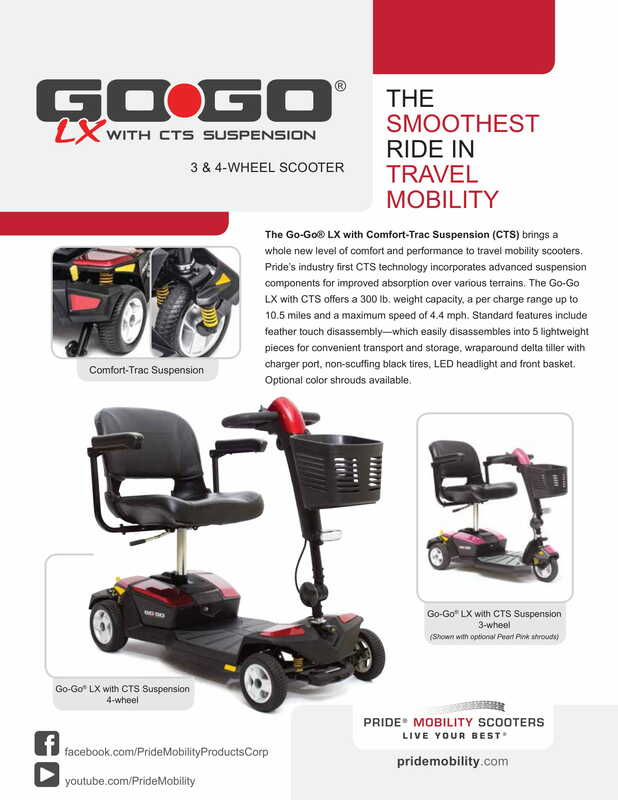 The advanced design of the Go-Go LX 4-wheel travel scooter sets a new standard for practicality and comfort. The seat post is mounted to the front section, giving greater stability to the ride. Standard features you’ve come to expect from Prides popular Go-Go lineup include easy Feather Touch™ assembly and disassembly, flat free non scuffing tires that won’t leave marks on your floor, Red and Blue interchangeable color panels and a front basket. Upgrades include a sturdy 300 lb. weight capacity frame, bright LED pathway light for safety. Pride's innovative Comfort-Trac Suspension smooths your ride over everyday obstacles- like uneven thresholds, and cracks in the sidewalk. The CTS springs even lessen the jarring of frequent stops and starts, improving your overall riding experience. Optional Black Pink, Orange or Yellow color panel kits are available, inviting you to truly customize this Go-Go. We love the transportability of the lightweight components - the heaviest piece weighs only 36.6 lbs. The opportunity to upgrade the battery from the standard 12 AH to the longer range 18 AH battery pack is a big plus if you plan to use your scooter for longer distances. The Go-Go LX 4-Wheel comes with an additional charging port located up on the tiller, just below the key switch, for ease of use and convenience. The Go-Go LX 4-Wheel comes with 1-Year In-Home Service FREE . If you experience a problem with your scooter during the first twelve months, simply call SpinLife to arrange for a technician to come to your home for diagnosis and repair. You may also choose to extend this service for up to three years for an additional charge.See details at right. If ordered before 1 PM with all standard options, this item ships the same business day from the warehouse via FREE curbside or inside delivery. If you have selected White Glove Delivery, expect an additional 1 – 2 business days before it leaves the warehouse. Required assembly upon delivery includes attaching the seat (and any accessories) and charging the batteries for 8-12 hours prior to use. Although the scooter is easy to assemble and disassemble, it will arrive in a single heavy box. If you will require extra assistance, consider “White Glove Delivery” to have your scooter brought inside your home by appointment, assembled and all packaging removed for you. Please note: White Glove Delivery agents are not permitted to conduct patient training on equipment. Why Pride: Go-Go LX 4 Scooter?